Maybe The Answer Lies Within? 12 Comments on Maybe The Answer Lies Within? If you haven’t got hope for the future, then what have you got? If you haven’t got faith in yourself, then what have you got? If you haven’t got belief in your potential, then what have you got? I used to be a person full of anger, hate and constantly thinking,”why me?”. I had absolutely no hope for the future and simply prayed for the medical profession to get me out of the hell I was living. I hung on the doctors’ every word with bated breath for the answer to cure this debilitating illness. I truly believed that they held the key to my healing, not myself. That’s how it works, right? You go to the doctor and they give you pills that you believe will cure you of your ailment? However, upon this journey, it’s not a doctor that has got me to where I am today (despite seeing every migraine specialist possible). I believe that we are not meant to simply exist in pain and suffer throughout our lives. After exhausting the western medical system my only choice is to try another road and look inside myself for the answer. I truly believe that we were born to thrive and not just survive. My goal is to be known again as Christie and not be defined or identified by this crippling illness. Deep down I knew that the constant neglect of my health through a lifestyle of partying, travelling, little sleep, commuting, jet lag and exhaustion was surely going to catch up with me one day… and so it did. I didn’t want to admit it to myself for a long time, but now I can openly say that I caused this illness! My body chose to express this in the form of chronic fatigue, muscles pains and daily migraines. It was screaming at me to stop and look after myself, which I failed to notice until it was too late.We can all think of times in our lives when we have been blessed with full health, but as most of us do, we took it for granted. So if we can create this illness in our bodies, then surely we are able to reverse it too? You should see the library of self-help books I have at home. I have created quite a collection that has inspired me that change IS possible. I always make sure I have a book on the go at all times, many I have read several times over, but for me it acts as a daily reminder to change my way of thinking. These books have shown me numerous examples of people who have healed their bodies from the worst situations imaginable. Now if Maurice Goodman can rebuild his spine after being paralyzed from a plane crash, then surely I can reverse this condition that I spent the majority of my life without? It felt like someone had just stuck a knife through my chest. Maybe it was all true? After all, millions of people around the world suffer from this illness and live for decades with it suffering relentlessly. People were constantly reminding me of this! It didn’t help that at the time I was suffering with a really bad migraine. I questioned myself, maybe I was just living in a day dream and needed to wake up to the reality that my life is destined to be painful forever more? Left bewildered and feeling rather low I pondered if the universe was really working for me in the way I had hoped. That’s when I got the most almighty sign that, yes it is! The book “You are the Placebo” by Dr Joe Dispenza was like a shining light guiding me back on the right path. My Mum had brought it to my attention and it arrived on my doorstep at the exact time I needed the reassurance. This inspirational story of how Dr Joe healed himself through thought alone, after breaking six vertebrae and suffering numerous compression fractures in his spine after a triathlon accident, inspired me more than ever before that you have a choice to heal your body. You can choose to accept your fate and live with the diagnosis the doctor has given you, but I’m sorry, I am not going to live with these migraines for any much longer than I have to. This book combines the science behind how you can heal your body, providing examples of healing’s from his workshops and evidence from brains scans, and teaches you how to change your beliefs and perceptions which is the first step to healing yourself. In basic terms, through mediation (which you have to commit to daily) you rewire and make new connections in your brain, by firstly getting your brain into an Alpha state. This is the best way to tap into your subconscious mind. From there, you experience and imagine the new life you desire and all the feelings and emotions that go with it. Through intensively feeling the joy, the gratitude and rush of happiness from imagining yourself there in the future, your brain literally starts to physically change and create new neural connections and circuits, simply replacing the old ones to physically create a new you! Dr Joe backs this up with all the scientific evidence possibly needed! I literally have nothing to lose now as conventional medicine has failed me. Other holistic and alternative therapies have helped me gain a better quality of life however I refuse to live the rest of my life in this frequent pain. Take a look at Joe’s website for more information or find his YouTube channel to discover hundreds of testimonies of people who have changed their lives. Cancer cured, so called genetic illness’ healed …the list is endless! So from now on I am going to make the time every morning for one hour, just as he suggests, to meditate and to see if this really could work. 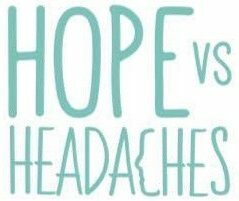 Follow my progress here at HopeVsHeadaches. You’re definitely on the right track! I suffered from migraines and daily headaches from the age of about 7-19. After having the worst three years from 16-19 I decided enough was enough. I kept telling myself there was no such thing as migraine (you can always fool your own mind!) and that my head was clear and well. I told myself I was healthier than ever illness free. I’m now 25 and haven’t had a single migraine attack in over five years. I get headaches every now and then, but they’re nothing compared to what I’ve had to endure before. As long as you keep giving your illness attention, it’s gonna stick around. Come up with ways to make it smaller than it is (even if you have to pretend at first) and you’ll see that it’ll eventually shrink in proportion. My mom even got rid of a malicious tumor the same way. Hi there, I feel lucky to have read your article. I am actually feeling encouraged and motivated. Your article has actually answered some of my questions, that kept boggling my mind. Previous Entry A Migraine Must Have! Next Entry My Fantastic Results After Only One Week of Using Dr Joe Dispenza’s Meditation CDs!